When Studio Ghibli announced it was closing production of feature films in 2014 many saw it as the end of an era, even if they did take back that statement a few years later. However, director Hiromasa Yonebayashi (The Secret World of Arriety, When Marnie was There) and producer Yoshiaki Nishimura (The Tale of Princess Kaguya, When Marnie Was There) instead saw it as a beginning of a new one. Studio Ponoc’s goal was to continue in the footsteps of their teachers, taking with them a large group of Ghibli regulars, whilst also braving the new ever-changing world of the modern anime industry. Their first feature release, Mary and the Witches’ Flower, finally releases in UK cinemas 4th May, so we sat down with the creative pair to discuss the creation, production, and future of the fantasy adventure and their newly founded studio. How did you find the process adapting the book to the script? Our previous work Marnie was a very quiet piece exploring a girl’s internal journey and this time we wanted to make something very action packed which had a lot of. We were looking for books and read many many original texts and that’s when we encountered [The Little Broomstick]. The book itself is very very interesting, it’s full of fun with a lot of speed and it makes you really get excited. Upon making the film we wanted to add another transformation scene which was the animals which altered to other beings. Mary had issues with herself but through her adventure she tries to use her strength and power to help her friends, which leads her to manifest herself into another being. That’s her vertical pull. Her horizontal pull is Mrs Mumblechook and Dr Dee as they’re trying to alter other people and that is another gigantic theme. Yonebayashi-San, you’ve said that the essential theme of the film is transformation, and while some grander animated moments such as the animals escaping are incredibly difficult to create you put much more effort into the scenes where Mary loses her power and has to change herself. What is the difficulty you find in expressing internal transformation versus external transformation? Initially Mary has an inferiority complex about her ginger red hair and she was so unhappy that she would curse herself in the mirror – but eventually through her adventure they don’t matter to her. Initially she was thinking only of herself but eventually she discovered that she was able to sacrifice herself to save other people. That was the theme when I was designing these aspects. Also there is a symbol on Marys palm that indicates when she is granted power, enormous power. But when she really needed the power the most she was unable to use it, she would just see a little scar on her palm. Nevertheless, she would turn her palm into a fist and proceed to go forward. We wanted to portray her determination. That even when she loses the magical power she is determined to go ahead. We thought that this was important and would resonated with a lot of audiences. 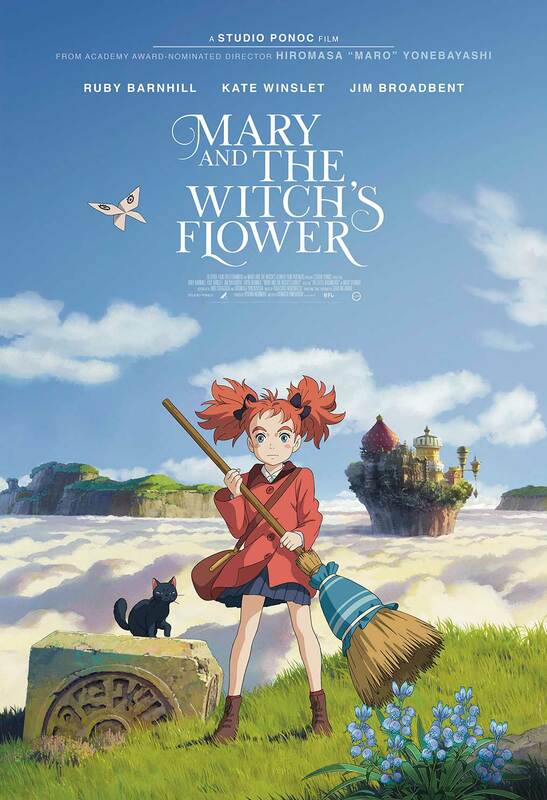 So what lessons are you taking from Mary and the Witches Flower, in both production and directing, into your next release Ponoc Short Films Theatre? We employed lots of hand drawn animators for Mary and we are confident that we fully employed their strength and power for the hand drawn animation. With the short films we are trying to employ lots of hand drawn animation and lots of CG animation as well, and it is our challenge to mix these two medias. Hand drawn animation and computer graphics. Mary and the Witches Flower comes to UK cinemas 4th May.